I also agree to receive daily, relevant offers from FreeCreditClick and Partners. FreeCreditClick in partnership with MyScore provides you with the tools you need to access and monitor your financial profile through the program's credit reporting and monthly monitoring benefits. MyScore Credit Monitoring and its benefit providers are not credit repair service providers and do not receive fees for such services, nor are they credit clinics, credit repair or credit services organizations or businesses, as defined by federal and state law. Credit information is provided by TransUnion Interactive, Inc. and CSIdentity Corporation. Under federal law you have the right to receive a free Credit Report from each of the three nationwide consumer reporting agencies once every 12 months. A free Credit Score is not included. After verification of your identity, your scores are available for immediate online delivery securely. Please note that the score you receive may not be the one your lender uses. 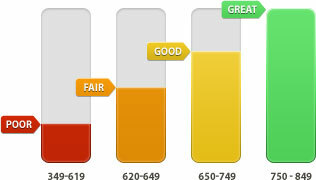 Scores shown are for illustrative purposes only.